New generation of web applications developed using ASP.NET and ASP.NET MVC can provide an excellent user experience with the help of client-side frameworks and libraries like jQuery, Knockout.js. 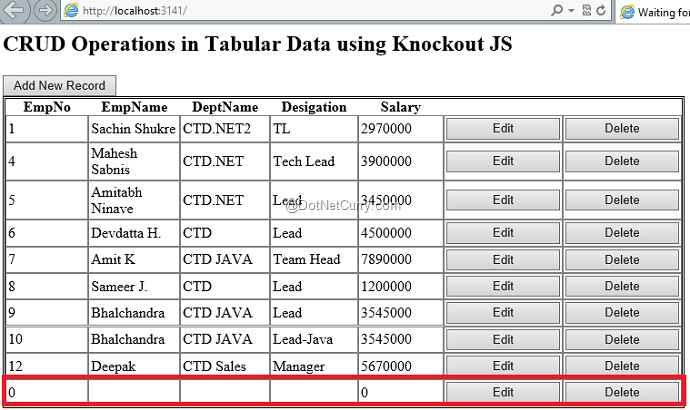 Recently I came across a requirement where we had to implement inline editing and CRUD operations on Tabular data. 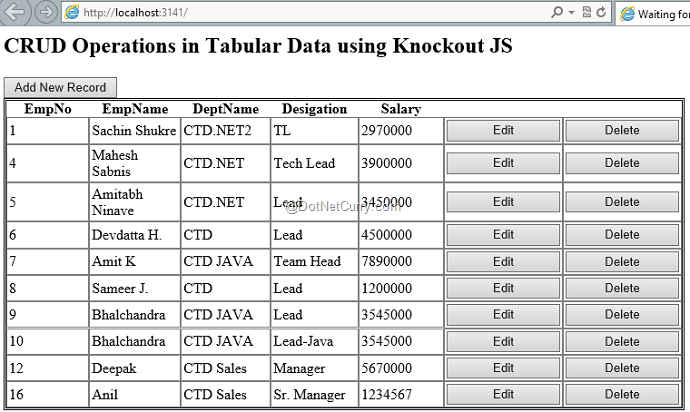 The requirement was to display all records in an HTML table, and allow users to add a new row as well as Edit and Delete records. In essence, the functionality was similar to like what we used to do earlier in ASP.NET GridView, but only this time it had to be done in an ASP.NET MVC application, preferably without un-necessary postbacks. 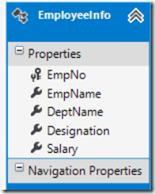 In this sample today, we’ll look at how we can implement this behaviour in an ASP.NET MVC 5 application. Step 1: Open VS 2013 and create a new MVC 5 application using the Empty project template and name it as ‘MVC5_Editable_Table’. 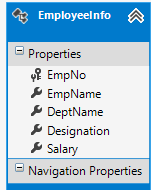 Step 5: Add a new Empty MVC Controller in the Controllers folder of name EmployeeInfo. Here you will get an Index action method. Add a new (Index) view in the application using the Index action method - Index.cshtml. 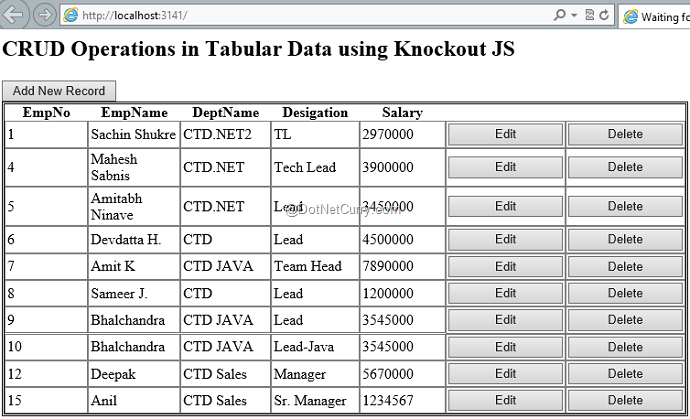 The above two templates are bound with the Employee objects’ properties. 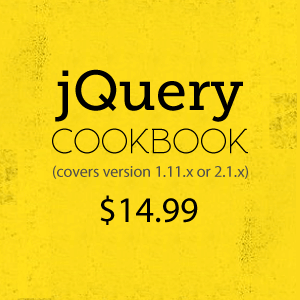 The readonlyTemplate will be displayed in the HTML table by default. This template contains ‘Save’ and ‘Delete’ button. When the end-user clicks on the Save button for a specific row, the readonlyTemplate is replaced by editTemplate. Now the end-user can update the employee details and when the Save button is clicked, the record will be posted to the server. Note: In the screenshot, you might have observed that the EmpNo is not in a sequence. This is because I was experimenting with Edit and Delete. In your case, you should see a proper sequence. When adding a new employee, then click the cancel button, the code has remove the newly added employe pushed in when clicking on "Add new employee" button. HELLO FANTASTIC WANNA ADD GRAND TOTAL OF SALARY DOWN THE LAST ROW ? HOWZ ITS POSSIBLE ? I have serious issue with the Knockout script as follows. My function are not executing in sequence manner. my objective is to set the drop-down values in the EDIT mode. so some times its showing pointing it to right data some times its setting 0 vales. here is my code. I am really frustrated.Please help me out. Can I add an Employee and the row for the added employee is already in edit Tamplate?